living in nashville, no matter how much i appreciated cowboy boots, i didn’t feel like i could wear them. because, well, i lived in nashville, the home of country music and cowboy boots. i didn’t want to be ‘branded’ as a tennessean. wearing cowboy boots in nashville isn’t ironic, and there is something about buying into the culture that i was resisting. adopting a certain look/trend is something i’ve become increasingly aware of. i constantly think to myself, do i want x, y, z, because i’m being told to want it. or do i actually like it? clogs/platforms are a great example of this. i totally loved my clogs back in the early 90’s. they made me taller. heck yes, i wanted a pair. and now they’re back in all their glory. and i find myself loving the look. but in between these two decades, i wouldn’t be caught dead wearing them. so what’s that about? the idea of being a slave to fashion is enough to make any free-thinker feel uneasy. when i look at my husband with his tornado of curly hair being tamed by a sunshine yellow headband, i am inspired by his attitude about it all – he wears what he likes. not because he saw some celebrity rocking a headband or because american apparel seeped into his brain. he has a few items of clothing picked up from thrift stores etc, and he makes do. he probably puts about 30 seconds of thought process into what he’s gonna wear. it’s basically just a decision whether it’s a ‘jeans day’ or ‘grandpa pants day’. it’s seriously that simple. is he at the height of fashion rocking super skinny jeans with a bow tie and a reverse-mullet hairstyle? no. does he care? no. i like that approach. watching Coco-Before Chanel on the plane from toronto i was so inspired by her guts. the biopic depicts Chanel as an instigator of fashion, not a mere adopter. she was a visionary who disliked the corsets and feathers and fluff that the parisians were caging their bodies in, so she stripped her designs of all the excess and what was left was delicious architecture and minimal lines and lots of black. after watching the movie i wanted to go into my wardrobe and purge. get rid of anything that wasn’t beautifully made, or had a lifespan of 13 minutes. but i’m also frugal. and SOMEDAY i might need my white leather jacket with lime-green silk lining, so that’s not going anywhere. today, when i saw urban outfitters new ‘silverlake’ hoodie. i felt annoyed and was insulted by the superficiality of fashion. 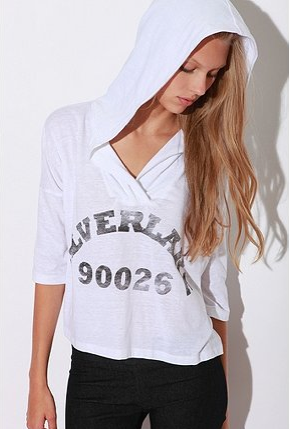 yes, silverlake is a trendy neighborhood, but to brand the location on clothing is super contrived. and from what i can tell, if you are a fashionista who lives in that neighborhood the LAST thing you would do is wear a hoodie that informs the world of this fact. right? i guess, i’m feeling sensitive about fashion/style lately. LA does that to a girl. there are beautiful boutiques all over the map and i’m constantly admiring people’s creative stylistic decisions. but it’s still just stuff. stuff that is uber cool today, and passe tomorrow. and before i mislead you, this post isn’t some rally against fashion. some of my closest friends are the most style-forward people i know and i truly think fashion design is an amazing outlet for creativity and artistry. but how do you figure out your own voice in the midst of an ambush of messages?